Here are eight doable agricultural practices to mitigate the impacts of global climate change. Billions of dollars were lost due to unpredictable climate changes all over the world. While debate rages on, whether climate change is man-induced or not, resolute actions must be done to mitigate the impacts associated with this global phenomenon. It was originally pointed out by this author that the major contribution modern agricultural practices make to the global climate change scenario are emissions of greenhouse gases namely methane and carbon dioxide (see Regoniel, 2010). Since current agricultural practices is the recognized source of these greenhouse gas emissions, mitigation must therefore address issues concerning reduction of these greenhouse gases either through emission prevention or sequestration of atmospheric emissions especially of carbon. How then can agricultural practices prevent or minimize greenhouse gas emissions as well as sequester back what has been emitted into the atmosphere? 1. Plant crop varieties that better reflect sunlight back out to space. By planting crops that have high reflectivity or albedo, summertime temperatures could be reduced by more than one degree Celsius in places like Eurasia and central North America. This approach is referred to as bio-geoengineering. Selection of crops that have high reflectivity can reflect sunlight back out into space and lower global air temperature. Organic farming enhances soil quality particularly in keeping the soil moist. Done on a large scale, these agricultural practices can prevent drying of land and land degradation due to the use of chemicals fertilizers. To reduce excessive emission of greenhouse gases as well as water pollution due to unabsorbed fertilizers, precise application of fertilizers is recommended by scientists. 4. Reduce consumption of meat. Reducing the consumption of meat products on a global scale can decrease the amount of methane-producing animals raised to supply global demand for meat. This will also reduce land areas that need to be cleared for cattle grazing. These grazing lands can be grown with cover crops instead to serve as carbon sinks or storage. Also, crops with high albedo reflects back excessive sunlight into space as pointed out earlier. 5. Grow diverse crop varieties. Growing diverse crop varieties that are less reliant on fertilizer and fossil fuel inputs can reduce crop vulnerability to unpredictable weather changes. This will be much more advantageous than monoculture farms which are susceptible, not only to extreme climatic conditions, but also to pest outbreaks during abnormal climate conditions such as those brought about by El Niño. Planting crops with a wide temperature threshold value or pest resistant species can ensure survival. Selection of indigenous plant material that evolved through time can therefore be a wise option to take. 6. Plant trees in strategic locations in farms. Lost carbon sequestration capacity due to clear-cutting of trees for agriculture can be compensated by planting trees around farms or setting aside forest patches alongside farms. Care must be taken in selecting tree species to grow alongside farms as their fruits or flowers might attract crop predators or pests. This system is called agroforestry. Planting trees has the added benefit of serving as buffer against storms to prevent crop destruction. Further, trees send their roots considerably deeper than the crops. This allows them to survive a drought and protect both crops and land from too much sun exposure thus minimize water evaporation. Tree roots also pump water into the upper soil layers where crops can tap it, and create spaces for water flow. Leaf litter also generates compost and serves as mulch to keep water from escaping rapidly into the atmosphere. 7. Stagger planting of crops. Staggered planting of crops can prevent total crop failure due to abrupt climate shifts. Losses will also be minimized. 8. Use energy efficient systems (environmental technology) in running farms. Use of energy efficient technologies can significantly reduce emission of greenhouse gases from farm machineries. Sunshine Farm in British Columbia has been farming without fossil fuels, fertilizers, or pesticides. It runs essentially on sunlight. They produce their own biodiesel from homegrown sunflower seeds and soybeans. Three-fourths of its feed for horses, cattle, and poultry are derived from the farm. Electricity is provided through a 4.5-kilowatt photovoltaic array. Adoption of low-carbon environmental technologies such as wind, solar, biofuel, biomass, hydro- and geothermal power can make farms work in an efficient and sustainable manner. Government policies that encourage the above agricultural practices can help mitigate global climate change impacts. And of course, policies become ineffective if these are not implemented by concerned government, non-government and private institutions. Global climate change is a serious matter that should be addressed by environment-friendly agricultural practices whether this phenomenon is a normal part of the earth’s global temperature fluctuations or indeed it is anthropogenic or man-induced in nature. e-Science News, 2009. Strategic farming practices could help mitigate global warming. Retrieved on April 2, 2010 at http://esciencenews.com/articles/2009/01/15/strategic.farming.practices.could.help.mitigate.global.warming. Halweil, B., 2005. The irony of climate in Worldwatch Magazine. Retrieved on March 27, 2010 at http://www.worldwatch.org/node/572. Herro, A., 2008. Adjustments to agriculture may help mitigate global warming. Retrieved on March 27, 2010 at http://www.bluemoonfund.org/news/news_show.htm?doc_id=649332. Hindu, The, 2009. India: Organic farming to mitigate global warming. Retrieved on March 27, 2010 at http://www.hindu.com/seta/2009/12/24/stories/2009122450101400.htm. Maathai, W., 2009. Africa: Continent Must Protect Forests to Mitigate Global Warming. Retrieved on March 27, 2010 at http://allafrica.com/stories/200906231119.html. Regoniel, P.A., 2010. Two major agricultural causes of global climate change. Retrieved on April 2, 2010 at http://knoji.com/two-major-agricultural-causes-of-global-climate-change/. How do marginalized people living in vulnerable coastal communities adapt to the effects of climate change such as sea level rise? What is an example of this adaptation at the household level? The following article describes one of these interesting adaptations and its implications. One of the interesting aspects of research is discovering something new. Although a phenomenon has been there for a long time, it becomes a relevant point of interest once its occurrence is viewed more keenly and becomes a subject of discussion. Take for instance the cross-country research our group conducted last year in the coastal areas of the Philippines, Indonesia, and Vietnam to document the effects of climate change. One of those inquired in the investigation looked into the adaptation of marginalized fisherfolks to the hazards brought about by typhoon/flooding, coastal erosion and saltwater intrusion. What I found interesting in this climate change study are the unique ways by which marginalized people try to cope up with changes in their environment. In this particular case that we studied, the fisherfolks’ adaptation to the erosive effects of waves in the gradually advancing seawater was investigated. We visited three communities (locally called barangays) to find out if there are any signs of initiatives to mitigate the effects of sea level rise. There, indeed, are several interesting adaptations made by fishermen in the tropical regions such as the Philippines. I relate one below. Below is a picture of a household adaptation in response to rising sea levels that erodes the thin strip of land a few hundred meters wide. A series of temporary and permanent houses dot this habitable portion that lies between the sea and the concrete highway running along the irregular coastline. 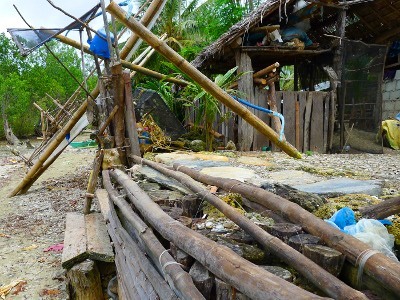 A makeshift structure built of logs, bamboo slats, stones and sand in Binduyan, Puerto Princesa as household adaptation to mitigate the erosive impact of advancing seawater. I noticed this ingenious way to keep soil from eroding in the beach of Binduyan, a coastal community lying east of Puerto Princesa in the island of Palawan in the Philippines. It may be a common sight to the uninitiated, but to someone who does research this means a lot. How many people were involved in constructing the makeshift seawall? How much time did it take them to build such structure? What opportunities did they lose as a consequence of working on the structure (see opportunity cost to understand how important this concept is)? Did the benefits justify the cost of construction or was it just a waste of time? Why would this family go to lengths in constructing this makeshift structure made of local materials? It’s unfortunate nobody was there to ask when we passed through as we walked the beach and note down observations. The owners were out somewhere, probably fishing. But these questions helped us design our questionnaire as this visit was part of our scoping activity. We measured the height of the whole structure. It is 1.2 meters in height! Did seawater rise that high? How many years did it take to reach that level? What is the distance of the water’s edge at high tide from this house since people living in the area took notice of the rising waters? Many questions arise as a result of this simple observation. And these questions will propel you to undertake research focused on your specific concern to contribute to the body of knowledge. That, of course, requires publishing your work for others to learn from. Research findings mean nothing if left unpublished. You may download and read the results of the study I mentioned above from the WorldFish website. It is titled “Economic Analysis of Climate Change Adaptation Strategies in Selected Coastal Areas in Indonesia, Philippines and Vietnam.” It is hoped that the findings of this research will aid policy makers in coming up with actions to mitigate the effects of climate change thus reduce costly damage to vulnerable coastal communities. What is the Difference Between Theory Testing and Theory Building? Essentially, what do graduate students do when they conduct a research investigation? Do they follow certain guidelines in doing their research? Is there a difference between how a master’s degree and a doctoral degree student do their research? What is theory testing and theory building? The following article answers these questions. Graduate students undertake research in two different ways. A master’s degree student engages himself mainly in research primarily aimed towards theory testing while a doctoral degree student undertakes a much more challenging research task of theory building. What is the difference between theory testing and theory building? Theory testing is relatively easier than theory building. Theory testing is primarily applied by the graduate student, as the name suggests, to test whether a certain theory of his choosing is a plausible explanation of a phenomenon he would like to investigate. If you are a master’s degree student, you can test this theory by looking into the humidity levels associated with carbon dioxide emissions. That is because it was mentioned a while ago, that carbon dioxide causes the water to evaporate. Greater carbon dioxide means greater water vapor in the atmosphere measured using, say, a wet and dry bulb thermometer. You will then have to find out if there is a correlation between temperature and surface humidity. This tests theory using specific factors to substantiate carbon dioxide effects to global temperature. 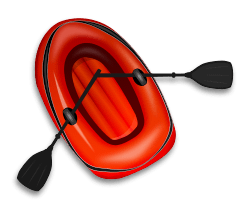 The main focus of theory testing is to find evidence to confirm or refute a theory. Theory testing, in this instance, tries to find out if there is there sufficient evidence to substantiate the Anthropogenic Global Warming Theory. Theory building requires the application of higher level thinking skills compared to theory testing. Doctoral degree students or dissertation writers engage in this kind of research. Theory building requires the synthesis of a broad range of literature and studies to provide evidence or confirm explanations to a given phenomenon. Theory building is the graduate student’s or a veteran scientist’s attempt to explain something plausibly in a different light or perspective. To further clarify the idea of theory building, take the previously discussed theory that tries to explain global warming, that is, the Anthropogenic Global Warming (AGW) Theory. The AGW Theory is just one of the theories that try to explain global warming. One of the responses of a coastal community to sea level rise due to climate change is to build seawalls. This adaptation prevents coastal erosion as a result of advancing waters. This measure, however, could prove futile as this picture shows. One of the responses of a coastal community to sea level rise due to climate change is to build seawalls. This prevents coastal erosion as a result of advancing waters. This, however, could prove futile as this picture shows. 1. Biothermostat Theory – the theory proposes that negative feedbacks from biological and chemical processes on Earth offset whatever negative feedbacks are caused by increasing carbon dioxide levels. 2. Cloud Formation and Albedo Theory – the theory advances the idea that changes in the formation and albedo (the proportion of light reflected by a surface) of clouds cancels all or nearly all the warming effects of greater levels of carbon dioxide. 3. Human Forcings Besides Greenhouse Gases Theory – the theory postulates that man influences climate is not only because of greenhouse gas emissions but likewise important human activities like clearing forests, irrigating deserts, and building cities. 4. Ocean Currents Theory – the theory explains that the variation of temperature worldwide was due to the slow-down of Thermohaline Circulation (a large-scale circulation of the ocean driven by differences in density due to changes in temperature and freshwater input) of the ocean. 5. Planetary Motion Theory – the theory attributes the recent global warming phenomenon to natural gravitational and magnetic oscillations of the solar system. 6. Solar Variability Theory – the theory suggests that global warming is due to changes in the brightness of the sun caused by bursts of energetic particles and radiation that periodically vary. These are all theories that try to explain global warming. The graduate student needs to read a great deal of literature and gain insights to build theories. Further, you must note that these theories are not perfect explanations of global warming. Some of these theories may be substantiated or confirmed through time. On the other hand, further theory testing will show their weaknesses. Whichever of these theories will stand rigorous scrutiny by researchers through further studies on the causes of global warming will come out as the best theory of global warming. That’s how science works. Bast, J. L. (2010). Seven theories of climate change. Chicago: The Heartland Institute. 30 pp. Are you a psychology student pondering what research topics to pursue in the course of conceptualizing your thesis proposal? This article is tailored right for your needs. You may explore the 5 research topics presented below and come up with your relevant psychology-based research topic on climate change. Specific research questions are offered for your guidance. I was prompted to write this article because a colleague asked me how her undergraduate psychology students should conduct their study in relation to the key result areas which the university is aligning its research programs, projects and activities. More specifically, she asked what topics could be explored by psychology students in relation to say, climate change adaptation as one of the key result areas. I initially gave several ideas that students can pursue during the lecture but these ideas still appear to be too general. Or maybe I have not put the topic in clear perspective. I, therefore, came up with the following specific research topics based on the initial list of topics I enumerated during a brief research orientation lecture with a group of undergraduate students and several College of Arts and Humanities faculty members. The students are currently conceptualizing their research proposal in compliance with the thesis requirement for graduation. The 5 examples on psychology research topics related to climate change are products of my online search as well as my research experience on environmental research and knowledge gained during my training in the graduate school. Specifically, the following research topics are psychology research topics related to climate change that students can explore. Of course, they need to do a literature review first to find out which topics and what particular issues were already explored. I drew out the following ideas mainly from the topics identified by the American Psychological Association. I rephrased the topics presented in that site to avoid duplication of words as I am conscious of plagiarism understanding that articles written using similar words will impact on the quality of articles written online. I also wrote these questions in such a way that it can be done under local conditions, i.e., relevant to the thrusts and priorities of universities in the tropical regions. But these can likewise be done in temperate countries. 1. How can well-designed environment-directed messages increase people’s behavior that are beneficial to the environment? Examples of environment-beneficial behavior will be the three R’s of recycling, reduction, and reuse of materials. I remembered that I wrote an article about an indigenous person who reused otherwise unusable materials from a nearby mining company to build a mini-hydro power plant in a remote place in Bataraza. See how Boyet, the Tagbanua, made use of materials in a materials recycling facility here. 2. Is there a relationship between climate change evidences like sea level rise, warming temperatures, and changing agricultural production to the quality of life of the members of the community? It would be great to know the relationship of the continuing fluctuations of the weather to people’s quality of life. Will these events be beneficial or detrimental in the long term? Many studies can arise from this simple question alone. The results of this study will enhance the quality of policy makers’ decisions on those government initiatives that impact on people’s lives. This also streamlines their interest and attention to deal with relevant steps to address the negative effects of climate change. 3. What prevents people from complying with the most efficient and effective policies of government? It will be interesting to know how people make decisions, whether to follow or not follow the rules and regulations, the ordinances, and the laws that pertain to climate change. What keeps people from complying to these policies and what encourages them to follow voluntarily or willingly? This is an issue I already discussed in my previous post on research topics about climate change and governance. You may read the article here. The decision making scenario can actually be represented in a model which will help predict people’s compliance to policies of government. Policy makers will then have a better view of his constituency’s sentiments. This is what people call science-based policy making. 4. Why is there a general concern about nature? What are the reasons behind such interest in conserving or protecting the environment? What can be gained from the environmental programs, projects and activities? Surely, everybody knows some of the answers. But which of these answers are the foremost reasons why people try to keep the environment intact or at the very least minimize exploitation? You may get exciting answers to the questions posed above. 5. How does climate change as evidenced by unpredictable weather events affect people? I remembered the disastrous flooding events in Marikina in Manila in 2009 and Iloilo City in the Western Visayas due to Typhoon Frank. The residents of Marikina as well as Iloilo never expected the flooding to occur for so many years. This caused a lot of damages to property and even loss of life. How do you think those people affected feel? What are in their minds on those times when life-threatening disasters strike? Should they have survived had they been prepared for such unpredictable event? Being prepared matters a lot. At this point, I do hope that with these research topics more ideas will pop out of your head. You can draw out and remember theories from the lectures given you by your teachers on human psychology that will serve as your theoretical framework as you embark to write down your conceptual framework. If you do not know yet the difference between these two concepts, read my article on the difference between the theoretical and the conceptual framework here. Is there any relationship between climate change and governance? What are the topics of interest regarding climate change and governance? This article defines governance as it is a vague term to many students and presents two major research topics related to climate change and governance. This will jumpstart ideas and focus topics for research purposes. In order to understand how climate change relates to governance and vice-versa, you should first have a good understanding of what governance means. The climate change issue is already well discussed in many literature and studies but governance appears to be a term that still baffles many especially undergraduate students trying to make their way about this subject. What then is governance? The following definition of governance makes clear the concept and lays down the foundation to beginning researchers on this subject in order to carry out studies on climate change and governance. Governance, as the root word govern connotes, does not necessarily mean government although sometimes governance is used interchangeably with government. The processes of government’s management of its affairs towards a desired order, of course, is governance. The government does governance but governance is not necessarily done by a government. There are actually many definitions of governance. From what I gather, I would adopt the United Nations Economic and Social Commission for Asia and the Pacific (UNESCAP) simplified definition as this site is devoted to simplifying things for understanding. Besides this is about climate change, a worldwide concern, that researchers would like to relate with climate change. Governance is the process of decision-making and the process by which decisions are implemented (or not implemented). This is an excellent, easily understandable definition of governance. It is a process. Therefore, it is something that people involved do in order to carry out whatever decision outcomes have been agreed upon or arrived at. Those decisions may be done by people in government but may also be done in a corporate setting and at different levels or scope, i.e., local, national or international. Now, since the definition of governance is in place how can the relationship between climate change and governance be studied? The next topic explores the issues to reveal research topics on climate change and governance. The following are two major topics on climate change and governance where other related topics can arise. 1. How do people’s compliance to laws, ordinances or resolutions relate to climate change? How do people behave in relation to laws and ordinances related to climate change? Since governance refers to the implementation of decisions through government policies or enactments, it would be interesting to know how this actually is being implemented in the field. Do people comply with climate change-related laws? What are climate change-related laws? Are climate change-related laws as seriously implemented as any other law the government formulated such as laws that are matters of life and death? How are these climate change-related laws implemented by the law enforcers and what are the outcomes? There are actually many issues associated with this as law or policy enforcement is usually associated with many flaws. What are incentives for people to respond and act accordingly to the intended desired outcomes of policy? Incentives here refer not just to punishment in terms of physical penalty but could be monetary in nature such as imposing fines. Are those fines enough to prevent transgression of laws? 2. How are laws and policies arrived at by those exercising governance? Are policy makers in any way well guided in the process of making their decisions? Where do they base their decisions? Are those decisions founded on some objective basis or are these just random fruits of the mind or merely self-interest? Good governance should be objective. Thus, there should be an objective basis for any decision made especially of a government that influences the citizens of a country through policies on climate change. What should policy makers then do to make their decisions objective? In order to effectively address the issue of climate change, the government therefore must have the correct statistics or background to base their decisions on. How are climate change-related laws arrived at? To be able to effectively implement climate change-related laws, there is popular belief that these kinds of policy making should be science based to be objective and effective. I heard from a climate change conference colleague that the Malaysian government is doing this quite well by engaging its researchers to do research for policy making purposes and really act on the recommendations made by them. Those in government have such high respect to their researchers. I wonder if this is happening in other countries that implement climate change-related policies. I expound on this policy making process in my previous article titled What is science based policy making? At this point I believe that many ideas on climate change and governance are already popping out of your head. Write those things down and start reviewing literature about them.